Most of us have fantasized about what it would be like to make a living camping, canoeing and sledding. Join Polly Mahoney and Kevin Slater, owners of Mahoosuc Guide Service for a reality check. Kevin and Polly will regale us with tales of the highs and lows when you take the public into the woods. 7:00-8:30PM, art show preview. Meet the artists while enjoying light refreshments. 12:00 - community cookout, bring something to share. At the dawn of Maine's history, more than a dozen Indian tribes occupied the land west of the Kennebec River. Today, they're all gone and Maine's remaining four tribes are all in eastern Maine. Find out why. From Farmington, Canton and Auburn to Norridgewock, Pemaquid, York, and Fryeburg, the White Man's presence profoundly affected Maine's first Americans. Peter Stowell, a Bethel native, will reconstruct their whereabouts and explain how they got caught between warring European forces. Join experienced hikers, Bob McQueeny and Glenn Saller for a guided hike up the 4th highest peak in Maine. This all-day, 7.6 mile round-trip hike is rugged with over 2000 feet of elevation gain and loss. This hike is best for experienced hikers who should bring the following: adequate water, lunch and fleece for warmth. Due to concerns about returning before dusk, the group will turn around no later than 1:00PM even if the peak is not reached. Meet at the trailhead (11.7 miles from intersection of Routes 2 and 26) no later than 7:45AM. 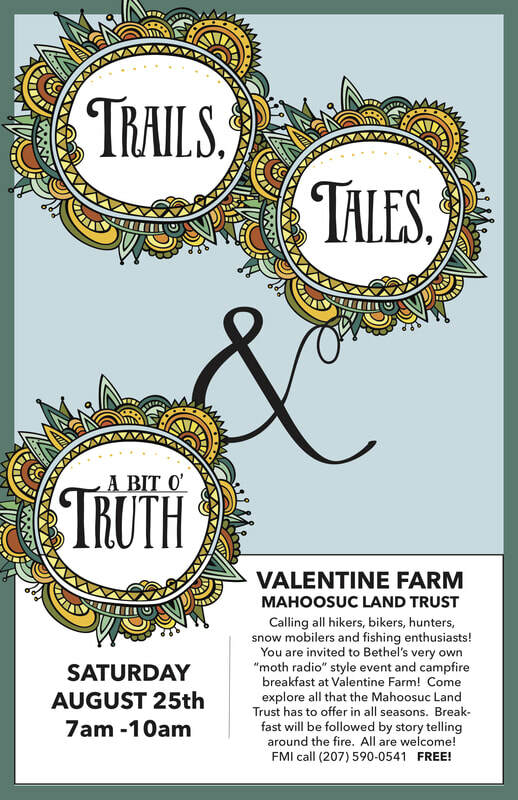 Come on out to Valentine Farm for a delicious breakfast cooked over the campfire by legendary local guides Mac Davis and John Wight, then listen to stories of the outdoors told in the tradition of public radio's Moth Story Hour--"true stories, told live, without notes." After a brief annual meeting, Roger Richmond of Spacelight Design will present Nature's Beautiful Tiny Spaces, a 3-D presentation that showcases the spaces inside of flowers, below the wings of a butterfly, ice in a tree and more. **cancelled** What Birds Are Around During the Dog Days of Summer? We are sorry to announce that this program has been cancelled. Birds sometimes appear to be lethargic and less active on late summer days much like us humans. However, there is still a lot to see and learn. Most chicks have fledged although they can often be seen begging parents. In some cases, newly fledged birds are the same size and color of their parents. Other birds, like warblers and birds of prey, are wearing a juvenile plumage which can make them challenging to identify. Join us as we collect data and make observations about what birds are doing as the summer begins to wane. The Whitecap Gourmet Hike, originally scheduled for tomorrow, Saturday, August 4th has been rescheduled for Sunday, August 5th. Meet at the trail head in Andover at 9:00AM. Dan Elliott will be leading the hike. Remember to bring something to share for lunch and a container for blueberries! Brianna Douglass, a 2009 graduate of Telstar, has been living and teaching for more than 3 years on the equator. Come on a journey to South America as she shares the sights, tastes, sounds and adventures of Quito, Ecuador. The warblers are here! Join a group of new and experienced birders on Saturday, May 19th at 8:00 AM to walk the trail at Valentine Farm looking for birds to add to the Farm species list. In the case of inclement weather, James Reddoch, bird enthusiast, will give an indoor presentation on how to use Cornell Lab of Ornithology's Ebird app. The Tiny House Project started a few years ago as a project to culminate Luke Hayward's final year at The Eddy School. Since then he, his father, Chris, and his grandfather, Gary, have worked together to construct his house, using creative methods (like trading bikes for siding) to keep costs and environmental impacts low. The three generations will share their building process and what they have learned building a solar-powered tiny home together. How many birds can be seen in one day? That’s the question that drives a ‘big day,’ a 24-hour birding binge that is a fond tradition among birders. The current record for a single Big Day team is 431 species, set in Ecuador. Traditional birding ‘big days’ focus on a single team of birders, which got Cornell Lab of Ornithology thinking: what if everyone in the world joined together for a single Big Day? The answer, it turns out, is an incredible 65% of all the bird species on the planet—at least. Todd Siekman, has been an avid swimmer his whole life. He began long distance ocean swimming 4 years ago for two reasons: to support the Lifeflight foundation, and as a means of recovering from brain surgery. He swims with 4 to 13 others, ranging from 13-69 years old, accompanied by up to 7 kayakers. They typically swim from 1.5 miles up to 5.5 miles depending on the day, weather conditions and ability of the participants. In the 18th century, Charles Messier cataloged over 110 deep sky objects (star clusters, nebulae and galaxies). Sometimes it is possible to see ALL of these objects on ONE night in the spring. Join star gazing enthusiast, Tom Hoffelder, for a night of enchantment. Tom has been looking through a telescope since 1974 and has seen 100 objects in one night. Cloud/rain date April 14th. Telescopes provided or bring your own. Unlike many of us, Caroline Blair-Smith and her husband, Andy, feel at home riding on a sled behind a team of dogs. They provide dog-sledding courses for Outward Bound, race in the Can-Am Crown in Fort Kent, and lead half- and full-day tours to the general public through their business Morning Crescent Sled Dogs. Come and learn about this fascinating lifestyle and try out a sled! Pack your bowling shoes and striped shirt and head to Valentine Farm for a moonlit evening of snow bowling by the warmth of a bonfire. Frozen milk jugs will be the balls and knocking down wooden pins is the goal. Marshmallows, chocolate and graham crackers will be provided, you bring a stick. This is all dependent on an evening of no rain! Chris Joosen in Tuckerman Ravine. Photo credit: MWAC. Valentine's Winter Games - Due to Weather, Postponed to 2019. Want to make an impression? Come to the Valentine Winter Games and be one of hundreds making a snow angel! NOTE: Valentine Winter Games Inclement Weather —in the event that the following weather conditions occur, the Valentine Winter Games would be cancelled: temperatures below 0°, temperatures below 10° with wind speed of more than 20 mph, a blizzard, freezing rain for more than two hours, or no snow. The second full moon of the month will light up Valentine Farm as we snowshoe the 1.2 mile universally accessible trail. This easy hike is perfect for people of all ages and abilities and is easily broken into 1/2 mile loops. This moderate, 1.5 mile round-trip hike leads to ledges with great southerly views of surrounding foothills, lakes, and ponds. Please bring snowshoes or microspikes and dress appropriately. Snacks and cocoa will be provided. We will meet at 10:00 at Buck's Ledge trailhead - just north of the public spring in Bryant Pond on Rt. 26. There is a sign and a parking lot. See you there! Have you ever seen the moon through a telescope? The moon will be in its first quarter, perfect for viewing through a telescope! Saturn will also appear later in the evening. Telescopes available for use, or bring your own. If cloudy, an indoor presentation will be given.